THIS is the Christ we love and THIS is the Christ that is preached. Please take two minutes to listen. It's the backdrop and context for this essay. It's very important. 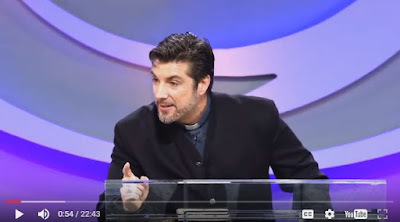 Shepherds' Conference Summit on Christology from Grace Community Church on Vimeo. Since the beginning, satan sends his representatives to pollute and destroy. He began with a serpent and continued with wolves and blossomed his lies into every religion in the world that is not the true faith of the worship of the true Jesus Christ. Resisting and pointing out idolaters, blasphemers, and wolves has been the business of the Christian since Peter's day, right through until the moment almost 500 years ago when in Wittenburg Germany, Martin Luther nailed his 95 Theses to the door at Castle Church, criticizing various elements of the Catholic dogma as having no foundation in the Bible. The attempt to reform the Catholic Church from within proved futile. It ended with a massive split, a gulf between the true Christianity and the false Catholic church. This event is known as The Reformation. And there the gulf stayed for 450 years. The Protesters became a denomination known as Protestant, and the Catholic stayed Catholic. The gulf seemed fixed and immovable until within the last 40-45 years. John MacArthur noted bridges being built back to Rome in 1973. More lately, disparate whispers emerged from wide-spread places in Christendom. Masked and wolfish "evangelical" eyes turned toward Rome in increasing volume and quantity. Some evangelicals pilgrimaged there, to kiss the hand that lit the match that burned brethren in former eras. Judases, all. Most recently, we read in last July's Catholic Herald that the Pope personally considers the Reformation to be over and is likely about to sign a public document stating so. He has believed this ever since the Lutherans signed the 1999 declaration making clear they no longer disagree over justification by faith. Pope Francis has been pursuing a reversal of the Reformation and reunion with other Protestants ever since. To that end, he has been successful. Now, news emerges of a document that declares the Vatican's opinion that the Reformation is over. This document, which is not widely known, is called "Declaration of Faith in Unity for Mission." All it needs is Francis' signature. 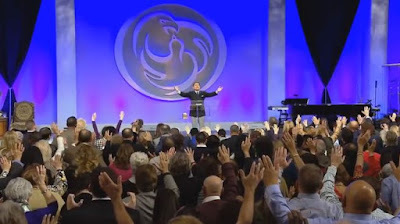 If you want to know what will make the biggest stride toward the Great Apostasy and who will form the bulk of the greatest false religion on earth, just picture 1.2 billion Catholics with half a billion Pentecostals and Charismatics, along with millions of liberal Evangelicals led by the likes of Rick Warren, Kenneth Copeland and James Robison, Beth Moore, Ann Voskamp, and Rachel Held Evans- all uniting under a false Jesus and declaring a false gospel. Is the Jesus you're worshiping "this same Jesus"
of Acts 1:11?The Catholic Herald article I quoted above gives quick recent history of the reversal of the Reformation from Pope Francis' perspective. I recommend reading it. Though many in America have been perplexed by Protestant leaders' rapid softening toward Rome, from Pope Francis' perspective it is no surprise, because he is the one behind it. It's that third section that is the most astounding. Catholics and Protestants agree that they are declaring the same Gospel? This is huge. Such a declaration, if signed by leaders of both faiths, would effectively be declaring the Reformation is over - AND that it was a mistake. When Francis wanted to reach out to Evangelicals after he was elected Pope, he didn’t do the obvious things. He didn’t ask the Pontifical Council for Christian Unity to organise a conference or seek advice from the group Evangelicals and Catholics Together in America – arguably the most advanced such dialogue in the world. Instead, he rang his old friend. During a leisurely meeting at the Vatican, [Tony] Palmer recorded a video of the Pontiff on his iPhone. Designated an "Apostolic Representative for Christian Unity" by Francis, Palmer took the film to a ministers’ conference in Texas organised by prosperity gospel preacher Kenneth Copeland. Palmer introduced the film with what must count as one of the great Christian orations of the 21st century. “Brothers and sisters, Luther’s protest is over,” he said. He told the audibly stunned audience that he was speaking to them “in the spirit of Elijah”, who prepared the way for something much greater than himself. introducing the Pope's video message. Source. They're already united: in satan. Now, with the 500th anniversary of the start of the Reformation looming in October 2017, great strides have been made in destroying the visible faith by a satanic reunification and total reversal of the most important religious movement on earth since the life, ministry, death, and resurrection of Jesus. Will Pope Francis publicly sign the 'Reformation is over' document? The Catholic Herald thinks so. Francis hasn’t given any public sign of whether he will sign the declaration. But he has taken steps that seem to prepare the ground for it. The author of that article breathlessly continued to state that the whole Pope-Evangelical thing is "pretty cool". In one sense, the "leaders" who have been promoting this hellish union with Rome, such as Rick Warren, SBC's Russell Moore and Ronnie Floyd, Joel Osteen, James Robison, Kenneth Copeland, Ravi Zacharias (is there any ecumenical gatheiring he won't attend? ), Michael W. Smith, Mark Batterson among others, (and most of those men I just listed will be attending the ecumenical event this weekend), are already united with Rome. There are only two faiths. The faith with satan at the head and the universal Christian church of saints, led by Jesus Christ. 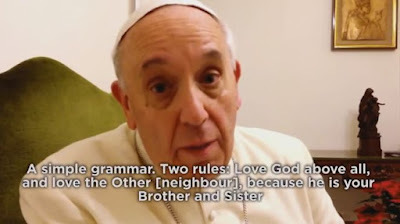 There IS a gulf fixed between the two, and anyone partnering with Rome to declare that they share the same Gospel is not of the faith of Jesus Christ. It's one, or the other. This next part is for ladies. Sisters, we have been warning you about the dangers of many of these liberal/mystical/ecumenical "teachers" for a long time, many of whom are participating in the upcoming Together2016 event this weekend. These are women such as Lindsey Nobles, Jennie Allen, (IF:gathering,) Christine Caine, (Propel Women, A21 campaign), Ann Voskamp (Romantic Panentheist and Mystical Romanticist). Again and again we warn not to partake of the evil fruit these women produce. That these Pope-friendly women are partnering at an ecumenical event, buying into the Pope's unification agenda, is to turn their backs on millions of martyrs who cried out to the Lord for mercy on their tormenters. It's to ignore the dark history where the shining Gospel was twisted, perverted, and suppressed- usually at the end of a sword. It should be the clarion signal that these women have nothing to offer you, nothing, not even one single tiny seemingly insignificant scripture quote you repeat on Facebook. Do not follow these women. 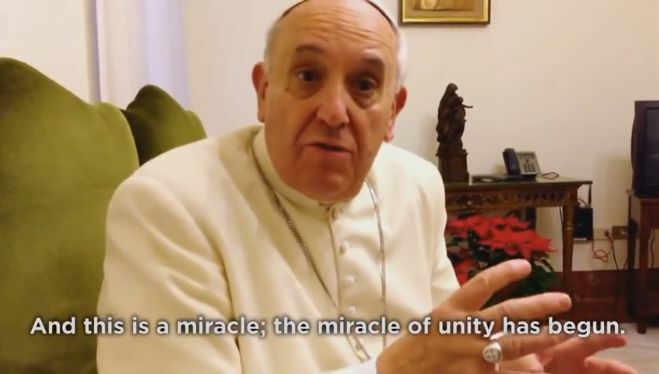 Catholic Philly reports that Lead organizer of Together 2016 and founder of PULSE, a youth campus ministry, Nick Hall, had a two-hour meeting with the pope on June 9. Hall told CNS he spoke to the pope about the event and spent time in prayer with him. Together2016 is at root, a Popish event, a ploy with an antichrist agenda. Don't buy it and avoid every single person associated with it. glory to God alone. Soli Deo Gloria. Their reasoning is literally so cultic.